So you finally decided to get back into shape. That's good! However, you may not know how much exercise you need to reach your goal. You might be thinking that you have to run 5 miles per day, or, you have to join a gym so you can lift weights. It turns out that this may not be necessary. For example, if your goal is to run a 10-K in under 40 minutes, you'll need to exercise (train) a lot differently than if your goal is to lower your risk of a heart attack. 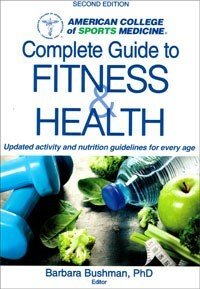 A variety of health organizations produce "official" exercise guidelines. Two of the most comprehensive sets of guidelines are from: the US Department of Health and Human Services (HHS), and, the American College of Sports Medicine (ACSM). These are summarized below. However, the American College of Sports Medicine (ACSM) has been developing and refining exercise recommendations for adults since 1975, when they published their first edition of "Guidelines for Graded Exercise Testing and Exercise Prescription." Their first official set of guidelines was published in 1978. Along the way, other groups either participated in, or, published their own set of exercise guidelines. These groups included the CDC, the US Surgeon General, and the American Heart Association. For a while, there was confusion over how much exercise the average person needed to do to improve/maintain their health. The 2008 report from HHS, followed by the 2011 Position Statement from ACSM, appears to have resolved much of the confusion. One important detail needs to be pointed out: When "official" exercise guidelines were first created, there was no distinction between "exercise" and "physical activity." Exercise was, as you might guess, equivalent to lacing up the running shoes and hitting the road, or, joining a gym to pump iron. That was the "traditional" view of exercise. Today, it is no longer considered necessary to exercise that hard to improve your health. "Every adult should accumulate 30 minutes or more of moderate-intensity exercise on most, preferably all, days of the week." This recommendation has been the basis of all "official" sets of exercise guidelines published since then. The major concepts from the Department of Health and Human Services and from the American College of Sports Medicine are summarized below. Aerobic exercise: For "substantial" health benefits: Perform moderate intensity activity 150 minutes per week (this works out to 30 min/day, 5 days/week), or, vigorous intensity activity 75 minutes per week. For "additional" health benefits: Perform moderate intensity activity 300 minutes per week, or, vigorous intensity activity 150 minutes per week. Muscle-strengthening exercise: Perform moderate-to-intense muscle-strengthening exercises at least twice per week. Aerobic exercise: While the guideline of "150 minutes per week" still applies, older adults should not push themselves too hard. Rather, they should do what their bodies will permit. 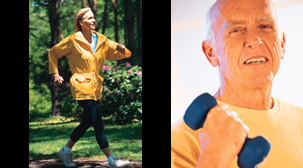 "Physical activity" is more appropriate than "exercise" for many older adults. Balance exercise: Because the risk of falling increases with age, older adults should also perform some type of balance exercises. 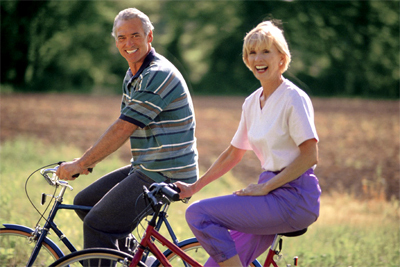 Perform physical activity at least 60 minutes per day. Part of this time should be devoted to muscle-strengthening activities 3 days per week, and, part of this time should include bone-strengthening activities at least 3 days per week. Exercise intensity and exercise duration should be considered together. A general rule of thumb is this: 1 minute of vigorous activity is equivalent to 2 minutes of moderate activity. The term "MET-min/week" also requires explanation. The calories you burn while sitting at rest is classified as "1 MET." During a slow jog, you might burn calories at 5 times that rate. If so, then, jogging, for you, would be classified as "5 MET's". If you jog at this pace for 100 minutes, then, you have generated 500 "MET-minutes" of effort. So, "MET-minutes" reflects both exercise intensity and exercise duration. "Neuromotor" exercise is a new term. 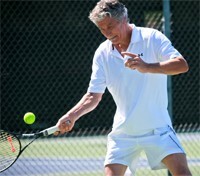 Here, ACSM is describing exercises that improve balance. Examples are yoga, tai chi, and Bosu ball exercises. NOTE: On November 12, 2013, the American College of Cardiology (ACC) and the American Heart Association (AHA) published their latest "Guidelines for Lifestyle Management to Reduce Cardiovascular Risk" (Eckel RH, et al. 2013). In this report, they recommend that people who have an elevated cholesterol level and/or elevated blood pressure perform aerobic exercise 40 min/day, on 3-4 days/week. To measure your heart rate, count your heartbeat for 10 seconds, then multiply that by six. The talk test is easier to accomplish. Just exercise at a pace that allows you to carry on a conversation while you're exercising. • Strength Exercise: free weights, weight-stack machines, stretch bands, or, exercises where you lift your body weight. Be sure to include exercises for every major muscle group (eg., arms, chest, back, stomach, hips and legs). Start with a weight that allows you to perform eight repetitions. Continue working with this weight until you can complete 12 repetitions. Add more weight when the exercise becomes easy. • Flexibility Exercise: Proper stretching involves holding a mild stretch of 10 to 30 seconds while you breathe normally. Always warm up before you stretch. Like strength conditioning, flexibility exercises should include stretching for all the major muscle groups. • Balance Exercise: Use a sturdy chair. Or, you can perform them in the kitchen where you can place one hand on the counter for stability. Read more about this in: "Balance: An Overlooked Element of Fitness?" The worst thing you can do for your health is to sit around all day long (Blair SN. 2009)......any form of physical activity is better than that! Even household chores (mowing the lawn, washing the car, vacuuming, etc.) have health benefits if you are currently sedentary. • If you choose MODERATE exercise: Try to do this 150 minutes per week. • If you choose VIGOROUS exercise: Try to do this 75 minutes per week. So, to put all this into "conversational" language: Get out there and walk briskly for 30 minutes per day, 5-7 days per week. You don't have to run, compete in triathlons, or exercise at a level where you are breathing so hard you can't talk. As you improve, try to also perform strength exercise, flexibility exercises, and balance exercises each week. Q: Is running the only way to improve my aerobic fitness? ANSWER: Absolutely not! Virtually any activity that is continuous, that gets your arms and legs moving, and "challenges" your cardiovascular system, will improve your aerobic capacity. In fact, for severely out-of-shape individuals, simply brisk walking (if done regularly) will increase aerobic capacity. The key is to push the heart rate up and keep it there while you are exercising. Q: I don't have time during the week to exercise. Can I do all of my exercise on weekends? ANSWER: Surprisingly, this scenario has been studied and the answer is yes! Relatively out-of-shape middle-aged subjects performed the equivalent of the recommended 30 min/day x 5 days/week program only on the weekend (ie., 75 min on Saturday and 75 min on Sunday) and it was found that they attained a similar level of aerobic fitness as subjects who exercised 30 min/day on 5 days (Meyer T, et al. 2006). Q: Are three 10-min exercise sessions equivalent to one 30-min session? ANSWER: Yes, this is acceptable. The amount of activity or exercise you do each day adds up. Q: I want to lose weight. Is walking "30 min/day, 5 days per week" enough exercise? ANSWER: Probably not. You may need to exercise 45-60 min/day, or even more. "Official" exercise and physical activity recommendations now exist. In 2008, the Department of Health and Human Services published "Physical Activity Guidelines for Americans" and in 2011, the American College of Sports Medicine updated their Position Stand on recommended amounts of exercise. Exercise does not have to be strenuous to be beneficial. Significant health benefits can be gained by walking, or, even doing household chores. For weight loss, more exercise is necessary. In 2017, ACSM published the 2nd edition of "Complete Guide to Fitness & Health." This book is intended for consumers. It is a very thorough resource, and may be a bit too technical for some readers. However, it is very current and is backed up by solid science. Why Exercise is the Best Medicine Ever!